Organic. 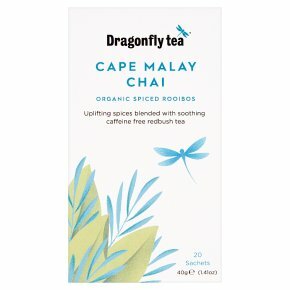 Uplifting spices blended with soothing caffeine free redbush tea Inspired by Cape Town's rich culinary traditions, this naturally caffeine free chai tea perfectly fuses European and Asian influences. Cape Malay spices are blended with soothing rooibos (redbush) tea from South Africa's Cederberg mountains for a deliciously warming cup. Brewing Instructions For a perfect cup use fresh, boiled water. Infuse for 2-4 mins according to taste.